The Internet that we know and use has gone through two major shifts or development phases, i.e. Web 1.0, Web 2.0. Web 1.0 was where internet standards were still being formalized and the internet was a set of static websites and pages. Web 2.0 was focused on social networking, collaboration, social bookmarking, and media sharing. We saw the emergence of social networking websites such as Facebook, Twitter, YouTube, Instagram, Orkut, Myspace, Friendster etc. Everything on the web became about interacting with people. From sharing new's articles to a picture of what you ate for breakfast became something you could share on the internet. 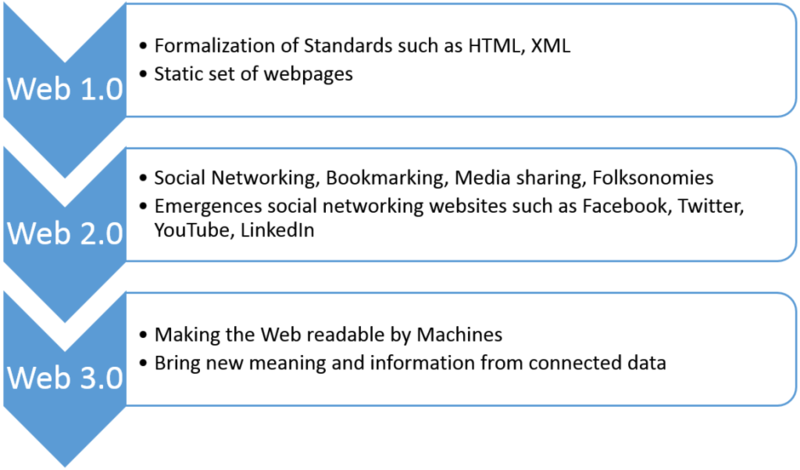 Web 3.0 or the semantic web will be the emergence of an intelligent web. Tim Berners-Lee, inventor of the World Wide Web, thought up the idea of semantic web. He had said that one of the major obstacles so far has been that most information on the Web is designed for human consumption. In order for the shift to take place, the web needs to be readable not only by humans but also by machines. This would allow the web to be more intelligent. Many companies such as Best Buy, Google, Facebook, Janseen Scientific Affairs LLC a subsidiary of Johnson & Johnson, Chevron, GE, the US Department of Defense, NASA, and others— now rely on Semantic Web technologies to run critical daily operations. RDF (Resource Description Framework): The data modeling language for the Semantic Web. 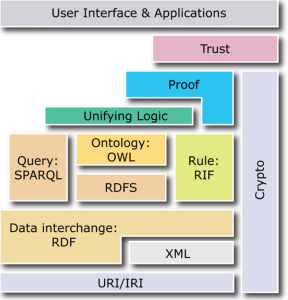 All Semantic Web information is stored and represented in the RDF. It provides machine understandable semantics for metadata. SPARQL (SPARQL Protocol and RDF Query Language): The definitive query language of the Semantic Web. OWL (Web Ontology Language): The schema language, or knowledge representation (KR) language, of the Semantic Web. Why is knowing about the Semantic Web important ? The semantic web and its technologies have not become mainstream, (relatively) few companies have started using or even realizing it's potential. While it is big in the academia, there have been a few instances of big companies using this technology. Check out Google's Knowledge Graph or even Facebook's' Social Graph. Both of these are based on semantic technology. For now there is no buzz going on in the industry nor the media about said technologies. But you need to get on board, because when the paradigm shift comes, it is going to be a big one. By reading up and implementing the technologies behind the semantic web, you can stay ahead of the curve.